The below one has course from various websites. 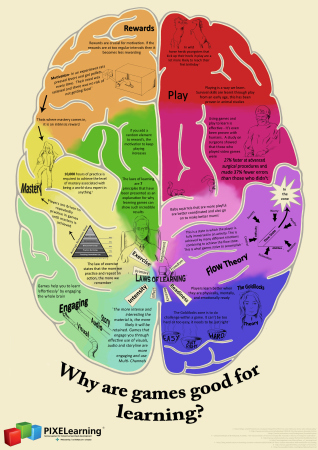 Why are games good for learning? Whoa! When looking for a surgeon ask him or her how often they play Call of Duty. Hand-eye coordination is need for some jobs so exposing our kids to games that require good hand-eye coordination could improve their job skills. Guess you don’t need to make sure all the games on your kids’ iPad are educational. Chapter 9: Think About It! The brain teasers get them thinking about something other than the road. It’s a bit of fun and the kids, in particular, love it. Bill Gates foundation is working with the Center for Game Science at the University of Washington on a free, online game called Refraction. The goal of the game is to rescue animals whose ships are stuck in outer space. The ships require different amounts of fuel, powered by lasers. So the players have to manipulate fractions to split the lasers into the right amount of fuel. “Imagine if kids poured their time and passion into a video game that taught them math concepts while they barely noticed, because it was so enjoyable,” Gates said during his speech at the ECS national forum. As students play, their progress is visible to the teacher on his or her computer, allowing the educator to see instantly what concepts students understand. Teachers have not had these tools before. Fragmented standards that differ from state to state and district to district have made it hard for innovators to design tools to reach a wide market. The common core will help change that. In the classroom of the not-too-far-off future, kids will have computer devices with phenomenal interactive content. This will allow teachers to do what they call “flip the classroom.” Instead of learning a concept in class and applying it at home, students would learn the concept at home, on video, and apply it in class, where they can get help from the teacher. When students learn a concept on video, they can take as much time as they need and learn at their own pace. They can pause the video, rewind it, or just listen to it all over again. Then the students can use class time to do the problems. The teacher sees instantly on the dashboard which kids are getting it, and steps in if someone is stuck. The students move on when they master the material, and not before. This is very different from the old method where every student moves on to the next topic after the test, whether you got an A or a D.
Now we finally have the answer to the old riddle of education – ‘do you teach to the faster kids or the slower kids?’ This technology will let you teach each child. And often, when the so-called ‘slower kids’ are given the time and attention they need to master a core concept, it turns out they accelerate – and they’re faster than anyone thought. I hope you’ll do all you can to help speed the adoption of new classroom technology. Teachers have waited long enough. Doctors don’t sit alone in their offices trying to find new ways to heal their patients. They’re supported by a huge industry that is constantly working to provide them better tools. Teachers deserve the same kind of support, and the common core state standards create an historic opportunity to make sure they get it.